This image illustrates the haze that engulfs Mars during major dust storms. These two images were taken in 2001, about a month apart. 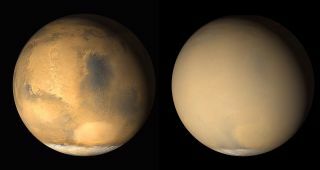 A raging Martian dust storm is expected to sweep across the Red Planet within the next few months, according to a study that found a way to predict these otherwise variable weather events. Global dust storms on Mars threaten robotic rovers traversing the Martian surface, as well as astronauts that may one day set up camp on the Red Planet. However, based on past weather patterns, Martian dust storms may soon become more predicable — and if history repeats itself, the next storm is just around the corner, according to a statement from NASA. "Mars will reach the midpoint of its current dust storm season on October 29th of this year," James Shirley, a planetary scientist at NASA's Jet Propulsion Laboratory, said in the statement. "Based on the historical pattern we found, we believe it is very likely that a global dust storm will begin within a few weeks or months of this date." Local dust storms are fairly frequent on Mars. However, these localized storms can grow into regional or, in some cases, global storms. The dust storm season typically reaches its peak during the spring and summer in the planet's southern hemisphere, when Mars is closest to the sun, NASA officials said in the statement. Dust storms on Mars create a massive haze that blankets the planet. The last global dust storm on Mars was in 2007. During this storm, NASA Mars rovers Spirit and Opportunity received scarce solar power, but were able to survive. "The global dust storm in 2007 was the first major threat to the rovers since landing," John Callas, project manager for Spirit and Opportunity, said in the statement. "We had to take special measures to enable their survival for several weeks with little sunlight to keep them powered. Each rover powered up only a few minutes each day, enough to warm them up, then shut down to the next day without even communicating with Earth. For many days during the worst of the storm, the rovers were completely on their own." Before 2007, major Martian dust storms have been recorded in 1971, 1977, 1982, 1994 and 2001. Using data on the orbital motion of Mars, Shirley discovered a pattern in the occurrence of these storms. He found other planets impact the momentum of Mars as it orbits the solar system's center of gravity. The planet's momentum increases and decreases in a cycle that lasts 2.2 years, slightly longer than the Martian year, which is 1.9 years. Shirley found that global dust storms tend to occur when the momentum is increasing during the first part of the dust storm season, which doesn't happen during every Martian year. The finding is reported in a new study, published May 2015 in the journal Icarus. The new findings are consistent with weather patterns of the past, as none of the global dust storms on record have occurred when Mars’ momentum was decreasing during the first part of the dust storm season, NASA officials said in the statement. Current observations of the Martian atmosphere indicate that conditions of this year's dust storm season are similar to those recorded during previous dust storm seasons. So far, however, a global dust storm has yet to develop. In late August, several local dust storms grew into a major regional dust storm by early September, but weakened before becoming a global storm. NASA's Mars Reconnaissance Orbiter will be keeping a close eye on the Red Planet to see what storms develop over the next several weeks.